Victory Brewing, a brewery and brewpub out of Pennsylvania, was founded back in 1996 by Ron Barchet and Bill Covaleski. In the meantime, they've grown to a production level of around 55,000 barrels a year, with their beers distributed in 23 states. The company is rather particular about using whole hop flowers, rather than the pellets or extracts many other brewery employ. HopDevil Ale, an IPA, seems to be their flagship brew. Victory describe the brew as "menacingly delicious, with the powerful, aromatic punch of whole flower American hops backed up by rich, German malts." The label features an distinctive little cartoon hop-devil character, who seems to be just a little too happy to be a considered a "devil." 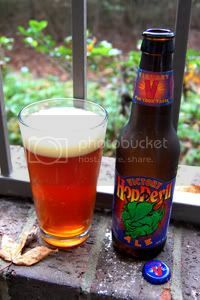 HopDevil has built quite a name for itself in the beer community as a very malty, yet balanced, American IPA. Appearance: A somewhat hazy burnt-orange body with a solid finger of off-white and bubbly head. Good lacing. Aroma: Floral, spicy, and citrusy hops balanced by a brown-sugary malt body. A bit of booze is lurking around the edges. Taste: Spicy, grapefruity hops dominate at first and are decently bitter. There's a solid biscuity, sweet, and nutty malt backbone bringing up the rear, well up to the challenge put forth by the hops. The booze is there, but stays in its place. Everything meshes well and is perfectly balanced. Mouthfeel: Medium-bodied with good carbonation and a somewhat dry finish. Drinkability: Goes back easily enough given the style and alcohol content. A good session IPA. Verdict: With a solid malt backbone balanced perfectly with brilliant hops, HopDevil is one of the best IPAs that I've tried yet. I'm very much looking forward to trying the other Victory offerings I can get my hands on here in Houston. Your description is spot on. This is one of my 3 desert island beers, so I would have given it an A+. Regardless, it's well worth every penny spent. The HOP is the thing here! This type of beer exists just for that bitter hoppy taste. You have to be a "hop-head" to appreciate it and to that crowd I must admit, I do belong!